With the ferocity of a football center, Krysha Jamis hiked a series of five-gallon buckets between her legs, sliding them to the front of a semi trailer outside the Great Plains Conference office in Wichita. Jamis was among about 50 volunteers – clergy, laity and conference staff – helping load another 1,675 cleaning buckets Oct. 3 onto a truck bound for the UMCOR Sager Brown Depot in Louisiana. It brings the conference’s total since hurricanes Harvey, Irma and Maria hit the United States and its territory of Puerto Rico over the past six weeks to 6,340 buckets. 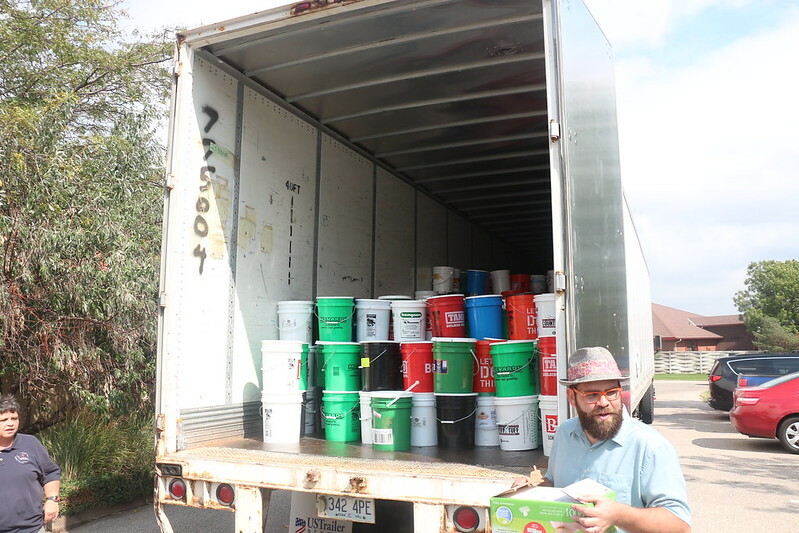 The buckets were accumulated at offices in Topeka, Lincoln and Wichita. Matching Jamis bucket-for-bucket for a lengthy period was Bishop Ruben Saenz Jr., who stationed himself inside the trailer as volunteers filed in and out while bucket brigades formed between the Wichita office building and parking lot. Bishop Saenz said he’s been humbled by the contributions of the churches in the Great Plains. The Rev. Hollie Tapley, disaster response coordinator, said she’s “extremely proud of the Great Plains Conference” for accumulating the cleaning kits. Tapley said she heard about competition between various churches, pastors and districts that helped achieve the goal. While the original need came from those facing hurricanes in Texas and Florida, Tapley said the main focus now is on Puerto Rico, facing the aftermath of Hurricane Maria. Two conferences in Texas, Tapley said, are ready to have Early Response Team members assist with cleanup. The Rio Texas Conference, where Bishop Saenz served prior to his election to the episcopacy, is only seeking ERTs at present. The Houston-based Texas Conference, led by former Great Plains Bishop Scott Jones, is accepting mostly ERTs and some United Methodist Volunteers in Mission. Churches that have extra supplies from the recent hurricane efforts are asked to donate those items to be put to use at the Midwest Mission Distribution Center in Chatham, Illinois. A Great Plains Volunteers in Mission team is planning a trip to deliver additional completed cleaning kits, hygiene kits, school kits and even partial supplies for those various kits. Items should be delivered to the Lincoln conference office at 3333 Landmark Circle by 5 p.m. Tuesday, Oct. 17. Other than the flood buckets/cleaning kits, please pack items in stackable boxes so they are ready to be loaded into a truck. Money for shipping must be included with all donations. See instructions for loading and shipping a cleaning kit/flood bucket. See instructions for loading and shipping a hygiene kit. See instructions for loading and shipping a school kit.